Our Route for the Brave team met Sgt. 1st Class Forrest “Frosty” Robertson's family in Kansas as they walked across America. 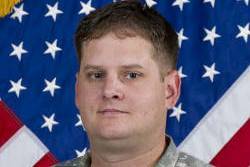 Robertson was killed in action when enemy forces attacked his unit with small arms fire Nov. 3, 2013, in Pul-E-Alam, Afghanistan. Robertson enlisted in the Army when he was 17 and loved it. He thrived with the people, discipline and structure and never hesitated to to re-enlist. He served his country for 17 years, doing what he loved, taking pride in getting his noys back home to their families. His mother, Dody Berg, said, "He was a man that believed in what he was doing and doing the best that he could." Watch his YouTube tribue here.